Employee engagement is much more than ensuring employees are “satisfied” with aspects of their jobs, including compensation, benefits, and basic work conditions. Engagement refers to the passion and energy employees bring to their work—the discretionary effort they put forth as a result of the quality of the employee/employer relationship. Of the five keys of ENGAGEMENT MAGIC® engagement model, the first is Meaning. 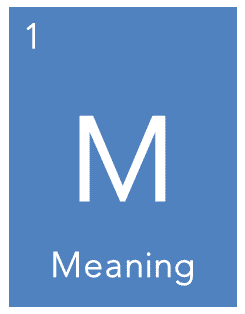 What is Meaning? It’s a very real and personal connection between what I value and the work I do. My work is something of value—something of worth. It is a major part of my self-identity, or at least involves a connection between who I am and what I do. In order to be engaged at the highest level, I must see the significance of my work and how it allows me to contribute to a greater purpose. I must personally connect to the mission of the organization, and see a clear intersection between my role and my values. So, what is the source of a person finding meaning in their work? For him and his staff, the meaning is inherent in the work they do. In this high-stress, fast-paced environment of emergency medicine, they are able to face the daily job challenges with the knowledge and conviction that they are, quite literally, saving lives. As the daily pressures pile up, that connection between what they do and what they believe is apparent. This leader ensures meaning is never lost. Each team member finds meaning in what he or she does, and each knows the importance of his or her role in driving the mission of the organization. But what is the relevance to you and me? Are we clear about the meaning of our own work? What if our work isn’t about “saving lives?” And what if the connection between our personal value system and the day-to-day work we perform isn’t as obvious? In order to find meaning in our work, we must clearly see the connection between what we value and what we do. For some, assembling a piece of equipment connects with a love of technology. Or it may connect to an innate desire to provide superior customer service by providing the best technological solution. Or, perhaps that piece of equipment is a pacemaker, which may be used to save the life of a father of two. That meaning is different for each of us. However, if we don’t see the link, our engagement is not as high as it could be. We might need our leaders to make the link between our hands and our hearts and minds—the connection between our work activities and how we think and feel about them. If leaders want to maximize employee engagement, then they must take an active role in connecting the work with a higher purpose. Steve Jobs wanted to “make a dent in the Universe,” and his most engaged employees wanted to help him do just that. They had the sense that their effort (and, under Jobs, suffering) was worth it because their efforts would change the world. Jack Welch helped employees, from the top of the organization to the bottom, to see the link between their efforts and “winning,” and he wrote the book on how to do it. As a result, GE employees typically see themselves as unflappable winners who are always ready for the next challenge. What have you done, or what have you seen leaders do to make the “meaning” connection for employees in your organization? What advice do you have for making a strong connection among hands, hearts, and minds? What results have you seen in terms of employee engagement?